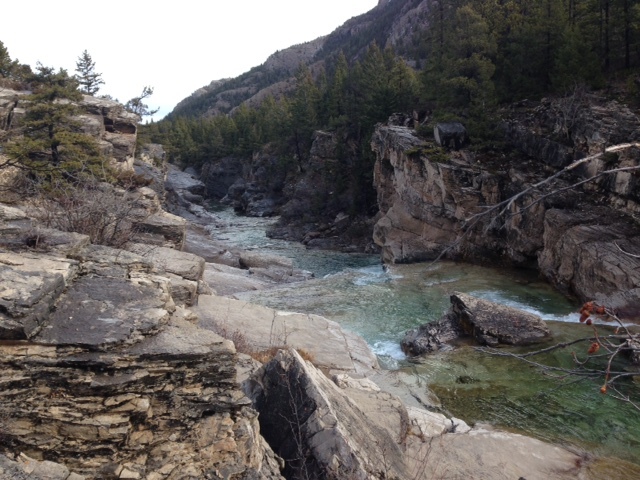 A short hike/ski to a beautifully sculpted canyon to glimpse the rushing waters of the Dearborn River! Directions: From Missoula, take I-90 to Bonner and then head north on Highway 200 well past Lincoln. Turn north on Highway 434 and drive 11.3 miles towards Bean Lake. At Bean Lake, turn left (west) onto Dearborn River Road (aka Dearborn Canyon Road). Continue on for 5.9 miles, passing by the Diamond Bar X Ranch and then turn left into the trailhead parking lot immediately after the Wilderness School of the Bible. What to Expect: Follow the well-signed trail that parallels the road for the first mile – and do stay on the trail because this initial section passes through private property. After one mile, cross a sturdy bridge over the Dearborn River and ascend this steepest section of the trail, which passes through open meadows and forested areas. After crossing the well-marked National Forest boundary at 1.75 miles, the trail becomes more level, with just a few small ups and downs before reaching Devil’s Glen at 3.5 miles. Devil’s Glen is in an open meadow with a well-used campfire ring and user trails heading down to the glen itself. Here, the Dearborn River has carved through the canyon, leaving behind beautiful rock formations. The crystal-clear glacial waters turn an almost iridescent blue as they pass through the canyon. It’s a picturesque spot for a snack or picnic lunch. Thanks to passage of the Rocky Mountain Front Heritage Act in December 2014, which added more than 65,000 acres to the Bob Marshall Wilderness, Devils Glen is now permanently protected! Check out the Montana Standard’s write-up of this trek HERE. Tip: For a longer hike or ski, continue on the trail a short way to a horse ford of the Dearborn River.